Lucas Oil Slick Mist 200 Daytona was real emotional for the hole team because we new that we had to qualify our way in the race and they were only taking the top 32 on speed. We ended up qualifying 32nd being under funded we really struggled trying to find speed with the car with the old body and the worn out motor and one year old used tires. but somehow dad kept making changes on the car and we made the race The race was a learning curve for me as I had never drafted before the start of that race. The car was not good by itself but I found it was good in the draft. After getting used to the draft I found a drafting partner (Ken Schrader's car driven by Tom Hessert) I started pushing Tom and we started going toward the front. I was running up in 13th when I ran out of fuel under caution for the green white checkered giving us a disappointing 35th place finish but it was a lot of fun for me and myself and the whole team learned a lot. JUST TO MAKE THE FIRST EVER DAYTONA RACE WAS AWESOME AND VERY EMOTIONAL !!! I ALSO WANT TO THE THANK PAT O’MALLEY FOR FOR MAKING THIS DREAM COME TRUE AND AN AWESOME JOB SPOTTING. I WANT TO THANK MY SPONSORS THAT CAME ON BOARD FOR DAYTONA VUKELJA LAW ATTORNEY, AIP DAYTONA.COM, BEVERIDGE MEDICAL ASSOCIATES AND SANGERFIELD AUTO & TIRE AND ALL MY CREW THAT VOLUNTEERED THEIR TIME TO HELP. Talladega qualifying got rained out so the field was lined by owner pints witch gave me the 32nd starting spot. finished 43rd after getting involved in the big one on lap 11. Pocono: qualified 19th and and was running in 16th when I got involved in a wreck that was caused by Bobby Gerhard's throttle sticking causing me to finish 27th . October 19th at Kansas speedway. Then testing in December at Daytona for the 2013 race in Feb.
George made ARCA debut at Pocono Raceway on June 11. Practice was on Friday, in the first round of practice George was 18th quickest but the car was too tight, the crew made some changes on the car and the car was better and George was 15th quickest but the car was still too tight. After the crew made some more changes to the car it was a little to lose and George spun the car. After the 24 laps of practice was over George was 15th quickest. George qualified 18th, George said that he didn’t want to wreck the car in qualifying. The race was on Saturday and the weather was not good, it was raining at the start of the race George missed a shift and fell back to 26th. From that point on George worked back toward the front again. George had made it up to 17th by lap 15. He was running lap times of the 12th place car. At this point in the race it was raining harder and the fog had settled in and getting heaver in the tunnel turn and the spotter couldn’t see the car on the back stretch or the tunnel turn. Coming down the back stretch there was a car on the outside and inside of George that crossed in front of him going into the tunnel turn. Causing George to have to check up and move up a lane to avoid contact with the car in front of him. When he started to change lanes he got up into the wetter grove on the track causing the car to hydroplane up into the wall. George however didn’t get back on the track because of limited funds and didn’t want to take the chance of doing more damage to the car. Knowing the race was going to be shortened due to the rain and fog. After the race was over according to the ARCA scoring sheets George was 12th quickest overall. 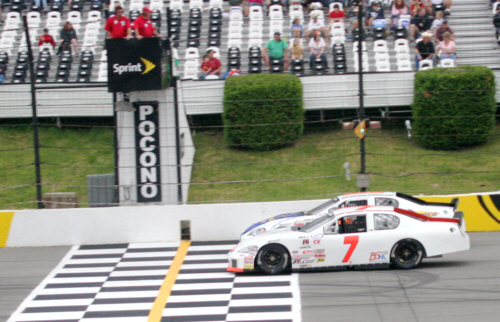 If George can find some sponsors he will be going back to Pocono on august 6th. and others if he can get enough funding. Overall George did an awesome job for his first time in a ARCA Car and on a 2.5 mile Superspeedway. Although his car is a "short track downforce car" and is short about 70 horsepower. OVERALL GEORGE DID AN AWSOME JOB FOR HIS FIRST TIME IN A ARCA CAR AND ON A 2.5 MILE TRACK. ALTHOUGH HIS CAR IS A SHORT TRACK DOWNFORCE CAR AND IS SHORT 70 HP. We want to thank Bob Schacht and the rest of the crew for all their hard work. George is looking forward to going back to Pocono on August 6th. 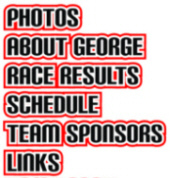 GCR is currently seeking sponsorship partners for the 2012 season, we have full season sponsorship packages or per race packages.